The African wild dog, sometimes called the African hunting dog or the African painted dog, may be a species you're not very familiar with. This multi-colored dog is a fascinating animal with unique behaviors. While African wild dogs are the oldest member of the canid family, they are not closely related to domesticated dogs. African wild dogs and regular dogs cannot interbreed. African wild dogs also differ from domesticated dogs due to their large litter sizes, which can have about 10 puppies on average. Typically, African wild dogs weigh between 40 and 79 pounds; they're about the size of a medium to large domestic dog. Their front paws only have four toes, whereas domestic dogs have a fifth toe, known as a dewclaw. They also have large round ears for an enhanced hearing ability, particularly during hunts or for finding other pack members. They have long legs, a slender body and busy tails that are always tipped with white. 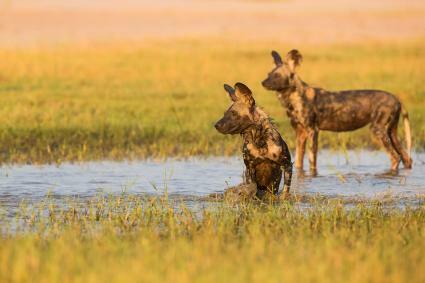 African wild dogs are also known as "painted dogs" or "painted hunting dogs." Their Latin name (Lycaon pictus) means "painted wolf." 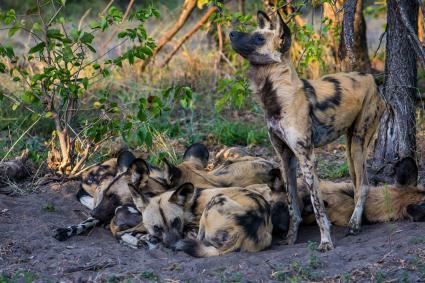 African wild dogs each have unique color patterns; no two look exactly alike. Their coat colors are a mix of patches and stripes of yellow, white, brown, grey, and black. Do They Bark Like Dogs? African wild dogs have a much larger collection of sounds they can make compared to domestic dogs. One of their distinctive vocalizations is a high-pitched noise they make when excited or meeting other pack members. African wild dogs are very fast. Some of their normal prey include animals known for speed, such as antelopes and gazelles. They can run as fast as 44 miles per hour while actively on the hunt. 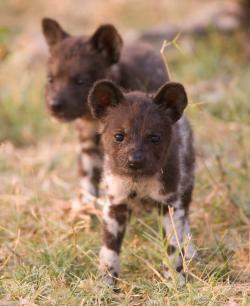 You can find African wild dogs in 14 different countries in southern and southeastern Africa. They tend to live in plains, savannas, deserts and woodland areas. 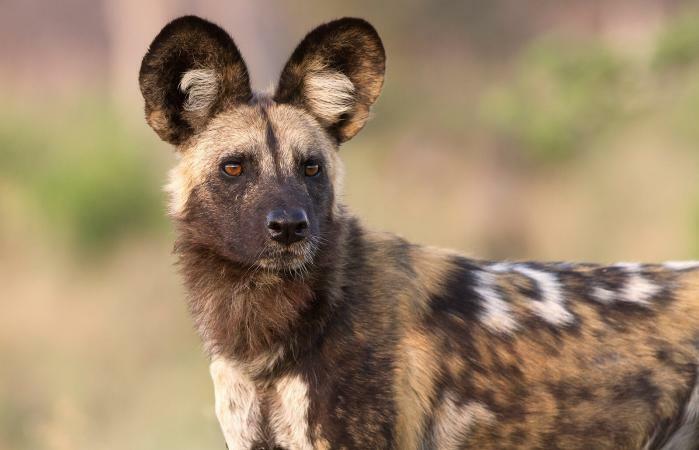 Sadly, the African wild dog is seriously endangered. It is estimated that fewer than 6,600 still live in the wild. Farmers will kill or trap African wild dogs to keep them from attacking their livestock. Along with the decreasing size of their natural habitat and exposure to diseases, this has had a devastating effect on their continued survival. They have been on the endangered species list since 1990. 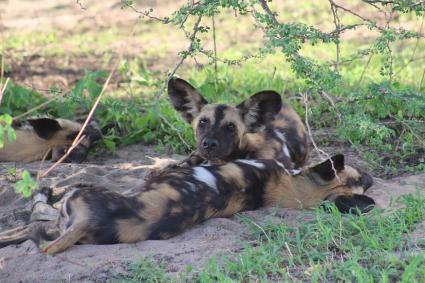 Organizations such as Painted Dog Conservation, the African Wildlife Foundation and the World Wildlife Fund are all working to prevent the extinction of the species through conservation efforts, community education and local projects with farmers to find effective ways to protect livestock without harming the wild dogs. Puppies live in dens for the first three months of their life until they are able to venture outside. The rest of the pack will help to nurture the puppies until they reach 16 to 24 months of age and can fend for themselves. Because African wild dogs are a wild species and a far relation of the household dog, they cannot be tamed as pets. Unlike dogs who have been bred over the years to have an affinity for working and living with humans, African wild dogs do not display these behaviors. African wild dogs live in cooperative packs of two to 40 dogs. While they have an alpha male and female who are the only breeders within a pack, they have a very social and supportive system and even "vote" on their activities. Injured, sick or old dogs will be cared for by the pack and brought food, which is very unusual among predator species. 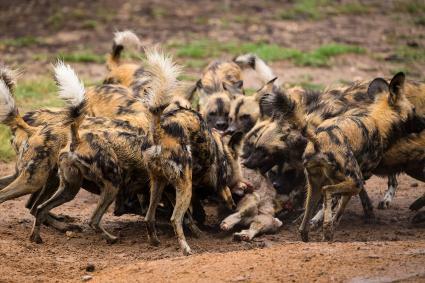 African wild dogs are known for extremely organized hunting behavior where the dogs work together to bring down prey that may be larger and faster. In fact, compared to other local predators like lions, they are more adept at catching and killing animals because they work as a coordinated group. Their success rate is estimated at 80 percent. By comparison, the typical success rate of a lion is only 30 percent. The majority of their diet consists of larger mammals like warthogs and antelope. If even larger prey like a wildebeest is sick or injured, they will hunt them too, supplementing their diet with smaller animals like rodents, lizards and even insects. The African wild dog's mix of colors earns them their painted dog nickname. These stunning creatures are intelligent and mutually supportive and caring of each other. With conservation efforts and zoo breeding programs, it is hopeful they can continue to survive as a unique species.